Navy blue shorts, with navy blue drawstring. Red hem around rear half of shorts. Thin white stripe down right thigh, beginning on waistband and ending in a point halfway down. White right-angle triangular shard at bottom of left seam, pointing upwards, with hypotenuse curving inwards. Two embroidered white concentric diamonds on left thigh. White number, in the same font as on the shirt, above the Umbro logo on left thigh. Embroidered emblem on right thigh, with 'ENGLAND' in capitalised white lettering inside a navy blue panel above the emblem. White socks, with navy blue stripe around rear half of tops, ending in a point at each side. Two large navy blue concentric diamonds on front of calf. A long-sleeved version of the shirt was also worn. The red shard continues beyond the left elbow onto the lower sleeve, ending in a point, with another point jutting outwards from the shard. Apart from the four games against Andorra, Croatia and Macedonia, the shirts worn by Ashley Cole also included his first initial i.e. A. COLE. The shirts worn by Joe Cole, Glen Johnson and the Neville brothers also included their first initial i.e. J. COLE, G. JOHNSON, G. NEVILLE and P. NEVILLE. Against USA, Andrew Johnson's shirt also included his first initial i.e A. JOHNSON. In the six World Cup qualifying fixtures, England had a black and white FIFA WORLD CUP GERMANY 2006 logo heat-pressed onto the upper right sleeve. For the four games in the World Cup tournament itself, England had a full-colour FIFA WORLD CUP GERMANY 2006 logo embroidered onto the upper right sleeve. 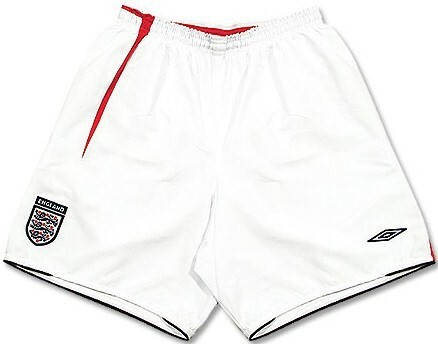 For the four European Championship qualifying fixtures, England had the UEFA EURO 2008 logo embroidered onto the upper right sleeve. The names of England's opponents, as they appeared in the match details, were ANDORRA, ARGENTINA, AUSTRIA, AZERBAIJAN, COLOMBIA, CROATIA, DENMARK, ECUADOR, HOLLAND, HUNGARY, MACEDONIA, N. IRELAND, PARAGUAY, POLAND, PORTUGAL, TRINIDAD & TOBAGO, USA and WALES. England were named first in the seven home fixtures and the four World Cup tournament fixtures, plus the game against Argentina. They were named second in the other eight fixtures. Navy blue hem around rear half of shorts. Thin red stripe down right thigh, beginning on waistband and ending in a point halfway down. Red right-angle triangular shard at bottom of left seam, pointing upwards, with hypotenuse curving inwards. Two embroidered navy blue concentric diamonds on left thigh. Navy blue number, in the same font as on the shirt, above the Umbro logo on left thigh. Embroidered emblem on right thigh, with 'ENGLAND' in capitalised white lettering inside a navy blue panel above the emblem. For the five fixtures played in this shirt in the 2006-7 season, John Terry, England's captain, wore a red armband, with the fixture, the name of the stadium, and the date, all printed on it in white, with the emblem also on it. 35 players wore this shirt. 6 players made their international debuts in the shirt, including Peter Crouch, who went on to make 42 appearances. Theo Walcott became England's youngest ever international when he came on as a substitute against Hungary at 17 years and 75 days old. Two of the debutants, Zat Knight and Luke Young went on to win all of their caps in this shirt. Knight's international career began and ended in the United States, with two appearances over the course of four days, whilst Young, who debuted in the same match as Knight, made it to the end of the year (2005), with seven caps in total. Kieran Richardson was the third player to make his debut against the U.S.A. and scored twice. His eighth and last cap was 18 months later on the shirt's last appearance. Paul Konchesky was the only other player to end his international career in this shirt. Two England players were sent off whilst wearing this shirt; David Beckham in a World Cup qualifier against Austria, and Wayne Rooney during the quarter-final against Portugal. Owen remained top scorer, despite sustaining a bad knee injury during the World Cup, which kept him out of the England team for a year. It also ended his attempts to score in his third successive World Cup finals tournament and his fifth successive major international tournament. Crouch netted eleven times in 2006 and became the first player since George Camsell in 1929 to reach double figures in a calendar year for England. He had begun the year without a goal at international level and even missed a penalty during the year. Only two players scored their first goal for England in this shirt; John Terry, in a pre-World Cup friendly, against Hungary, and Kieran Richardson, who netted a brace on his debut against the United States, but never scored again for his country. 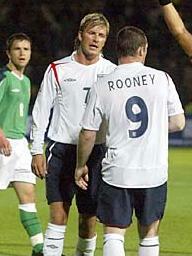 David Beckham was the only other player to score his last England goal in this shirt. His 17th was a free-kick against Ecuador that took England into the World Cup quarter-finals and enabled him to become the first man to score in three successive World Cup finals tournaments for England, the achievement so cruelly denied to Owen. Beckham, Campbell and Owen all captained England for the last time, in this shirt. Beckham announced his resignation as captain upon England's exit from the 2006 World Cup, and promptly found himself discarded by the new coach, Steve McClaren, for a year. Terry was given the captaincy for the last five games in which the shirt was worn. This smartly-designed outfit was worn by some of England's finest. Sadly, the performances didn't quite live up to the hype and the side failed to make its mark on the world in the summer of 2006. At least England looked the part. Much akin to the red away shirt, the gold star, now above the three-lions emblem, still reminded us of England's solitary World Cup triumph and the match fixture and date returned to their more-prominent position as on the 2001 white shirt, the middle of the chest, after being hidden away at the base, for the 2003 home white shirt. This shirt was also notable for the fact that small white emblems, complete with the team name, ENGLAND, were introduced to the base of the numbers on the back of the shirt, the first time that the Three Lions had found their way onto the reverse, though shadow emblems appear to have been used on the numbers on the 2004 red shirt. The only regular previous attempt to include symbols within the numbers had been with Admiral logos, also at the base, from 1982-83 (though Umbro logos were used on one celebrated occasion in 1987). If anything, the World Cup came a year too late for England, for in the spring of 2005, a confident side was sweeping all before them and threatened to qualify for the tournament with games to spare. The doubts set in at the start of the 2005-6 season when Denmark ripped their defence apart. Qualification was achieved, but not before a first defeat in Belfast, since 1927. A thrilling victory against Argentina restored faith, however, that England could still perform on the big stage and they went to Germany on the back of six successive victories. Expectation, as usual, was unrealistically high. Eriksson had only named three central strikers in the squad, one of whom was Wayne Rooney, recovering from a broken foot. He lost Michael Owen to a serious knee injury against Sweden, leaving Peter Crouch as the only fully-fit striker. The inclusion of untried 17-year-old winger, Theo Walcott in the squad, mystified the public and proved to be a pointless exercise as Eriksson chose not to use the youngster. England lacked firepower when they needed it the most and Portugal, just as in Euro 2004, exploited England's penalty shootout frailties and left Eriksson offering profuse apologies as he disappeared off into the sunset. Steve McClaren took on the mantle as England began the following season scoring goals for fun, until a goalless draw with Macedonia was followed by an error-strewn defeat to Croatia. Qualification for the next European Championship was not going to be as straightforward as had been predicted. Notes England wore the all-white kit, against Colombia. Notes England wore the all-white kit, against Croatia.